What Is DA Form 3964? DA Form 3964, Classified Document Accountability Record is an official form used by the Department of the Army Information Security Program and designed as a single-entry active or inactive document-control register. The form will commonly accompany a classified document and is used to bring a document "under control" according to local procedures. The DA 3964 is usually used either as a documented receipt, a certificate of destruction or a document-control copy. The latest version of the document - sometimes incorrectly referred to as the DD Form 3964 - was released by the Department of the Army (DA) in July 1979 and replaces the November 1972 edition of the form. 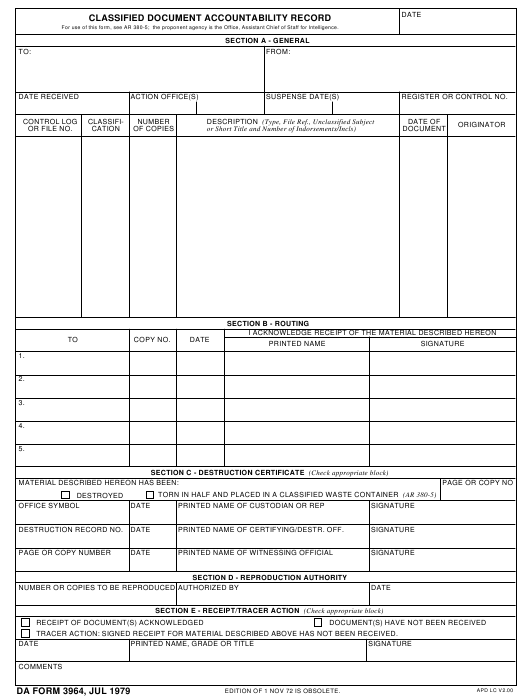 An up-to-date DA Form 3964 fillable version can be downloaded below or can be found on the APD Forms website. Additionally, the DA Form 4011 (Telecommunications Center Delivery List) is used by message centers as a multiple-entry control register. The AE Form 380-5A (Multiple Classification Message Destruction Record) may be used as a multiple CD for messages. How To Fill Out Da Form 3964? For use of this form, see AR 380-5; the proponent agency is the Office, Assistant Chief of Staff for Intelligence. PRINTED NAME OF CERTIFYING/DESTR. OFF. TRACER ACTION: SIGNED RECEIPT FOR MATERIAL DESCRIBED ABOVE HAS NOT BEEN RECEIVED. EDITION OF 1 NOV 72 IS OBSOLETE. Either a DA Form 3964 or a DA Form 455, Mail and Document Register may be used as active or inactive control registers. All registers will be maintained in serial control-number sequences by calendar year. Personnel filing the form must prepare enough copies. The current date is specified in the block labeled "Date" in the upper right corner of the page. The complete address of the agency where the classified document, will be sent is entered in the block labeled "To", and the address of the issuing organization is provided in the block labeled "From". The "Control, Log or File No." block requires a number specified on the classified document. The "Classification" block should be completed with a code to reflect the overall security rating of the of the document: TS - for Top Secret; S - for Secret; C - for Confidential. The exact number of copies of each document being transferred is listed in the "Number of Copies" block. The number of endorsements or enclosures. Section B - Routing - describes the transfer of the form and documents. Section C - Destruction Certificate - is filed if the classified material is destructed or disposed of. Section D - Reproduction Authority - is filed if the original document needs to be copied. Reproduction of classified material requires the approval of an originator or the higher DOD authority. Section E - Receipt/Tracer Action - specifies whether or not the classified documents were delivered and received.